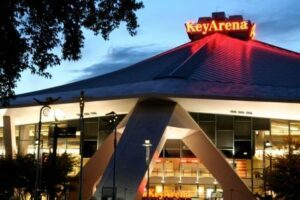 After 18 years, and hundreds of NCAA Championships, the pinnacle of college sport is returning to the Emerald City; this December, KeyArena is set to host the 2013 NCAA Division I Women’s Volleyball Championship. Four teams will arrive the week of December 16th, and through all of the pomp-and-circumstance, they will aim to leave KeyArena on December 21st with an NCAA Championship trophy in their possession. Being the sport-enthused town that Seattle is, there is no surprise that all 15,500 seats in KeyArena are on pace to be filled. It does not take a volleyball savant to enjoy these wonderful matches, only a lover of competition at its finest and a seeker of athletic thrill; or perhaps a simple historian looking to enjoy an occurrence absent from our city for far too long. The NCAA may not recognize our city after its dynamic growth and influence of the past two decades. Flashback to 1995. Seattle’s very own Pearl Jam was in the midst of their latest hit tour for the then second-fastest selling album in US history, Vitalogy. Microsoft had just released to the world its newest and most state-of-the-art operating system, cleverly named Microsoft 95. Over the airwaves, Frasier was in its second season of taking the country by storm and helping popularize Seattle lifestyle. The year also allowed rejoice for lovers of nature, as the city added to its repertoire of parks, with Magnuson Park created when the US Navy left Sand Point, a location held by the Navy since 1920. On the sports front, while calling the Kingdome their home, the ‘95 Mariners reached the franchise’s first postseason and advanced to within one series of the MLB’s World Series. Another tenant to call the Kingdome home in 1995 was the NCAA, as Seattle was selected to host that year’s Division I Men’s Basketball Championship. In April of ’95, UCLA would be crowned champion, with a major contribution from current Seattle University coach and then Sophomore Guard, Cameron Dollar. Fast-forward to present day Seattle, as it constantly evolves while keeping its distinct Northwest charm. Pearl Jam, still touring as I write this, has become immortalized in Seattle history and a new artist by the name of Macklemore has permeated the ears of Seattle’s youth. Microsoft remains a formidable force in the country’s tech industry and has attracted thousands of tech start-ups to set-up shop, concentrated mainly in Seattle’s Pioneer Square neighborhood. Amazon.com joins other regional giants, such as Starbucks, Microsoft and Boeing, in building its own Seattle mega-campus. SoDo has seen perhaps the most change of any Seattle neighborhood since 1995, becoming revitalized as the Kingdome gave way to two top-of-the-line facilities in CenturyLink and Safeco Field. The tenants of the South Downtown stadiums remain a happy constant, as sports fans in Seattle are as unwavering as ever. Nevertheless one tenant has been noticeably void to any Seattle facility. The Sonics may be your initial guess, though their heart-jerking absence has been for a mere five years, with the NBA’s return optimistically on the horizon. Said missing tenant is any sort of major NCAA Championship. Since April 3rd, 1995, no major NCAA Championship has been hosted in the city of Seattle. 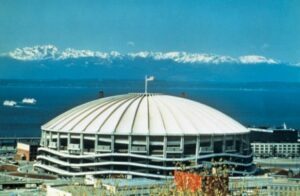 On that date in 1995, Seattle’s Kingdome was the center of the college sports universe when UCLA won its record 11th NCAA Division I Men’s Basketball National Championship. A Kingdome crowd of 38,540 fans packed into the arena featuring a basketball capacity of 38,471, all to see college athletics at its most intense level and witness thousands upon thousands of gym hours pay off in the form of a National Championship crowning. 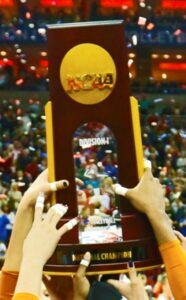 KeyArena hosts the 2013 NCAA Division 1 Women’s Vollyball Championships this December. Let’s help welcome the NCAA back to our city this December, whether that be by attending the matches, guiding a visitor, or simply enjoying the fan-fare to be had by any Championship when it arrives in your backyard. Here’s to Seattle’s next 18 years, filled with continued progression and a growing reputation as the primed city to host the next great sporting events. Alex Pache is the Program Coordinator for the Seattle Sports Commission. Born in Paris, he has also lived in Washington, D.C., New York City, Santa Monica and Syracuse, NY. He fell in love with Seattle his freshman year at the UDub and currently lives in West Seattle. He enjoys all activities that are outside, including downhill skiing, as well as sipping a fine Charles Shaw merlot and catching the action from his favorite sports teams.